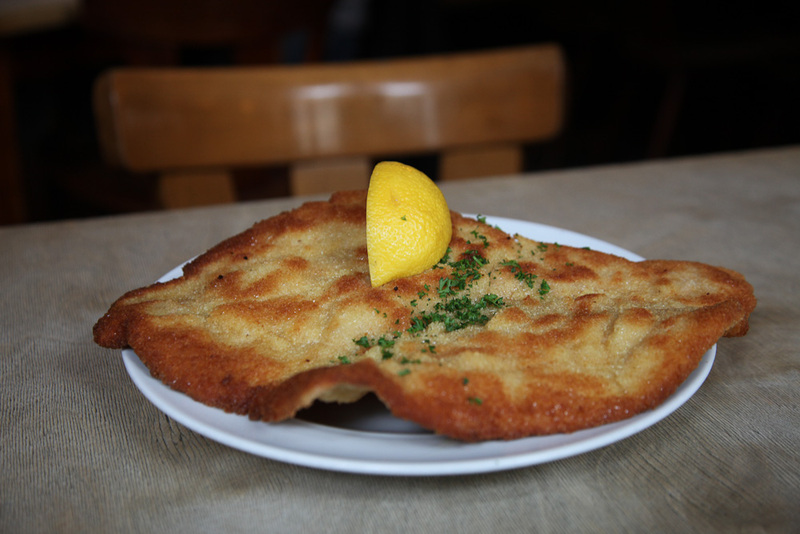 Do you like Wiener Schnitzel? Then Oma Kleinmann will make you happy. The old lady was still passionately cooking for her guests at 86. Her restaurant is not one among many; it is an icon that is appreciated by all classes and age groups. To follow Oma Kleinmann in her footsteps was not easy, but Olaf Wolf did it. After working side by side with the vigorous lady for a few years, he took on the job with his 33 years, and became the chef. With much instinct and tact he didn’t only succeed to maintain the spirit of the kitchen queen and her honest cooking, but also managed to make a turnover as they did in the 50s. Like before, nothing comes from a bag or can. Olaf Wolf also didn’t change the interior: white-scrubbed wooden tables, rustic corner benches and the wall panelling – all like in the old days. The only thing that is new is the kitchen and the team, which is young and extremely friendly. Cologne feels authentic and sympathetic here, like it should be.